The long Norwegian coast is home to millions of seabirds, the largest concentrations of auks and kittiwakes are found in the northern half of the country, with the exception of the famous bird island Runde near Ålesund. The southern and western coasts have few and relatively small colonies of species such as Herring Gull, Great Black-backed Gull, Common Gull, Arctic Tern and Common Tern. Some Lesser Black-backed Gull colonies number thousands of pairs, though, and some remote islands have hundreds of breeding pairs of Shag. In the southwest, typically Puffin, Common Guillemot, Razorbill, Black Guillemot, Kittiwake and Fulmar also breed, but in relatively small numbers compared to further north. The Common Eider is a common breeder along the entire coastline. The southernmost of the really large colonies is situated at Runde near Ålesund, where tens of thousands (maybe as many as 100.000) Puffins are the main attraction. Usually one can have very close views. The island also holds a large Kittiwake colony, and good numbers of breeding Common Guillemot, Black Guillemot, Razorbill, Shag and Fulmar. The first breeding colony of Gannet in Norway was established here in the 1940'ties, and today a couple og thousand breeding pairs represent by far the largest colony in the country. Between 20 and 30 pairs of Great Skua also breed here, which is the bulk of the Norwegian population. Leach's Petrel and Storm Petrel have been proven to breed on some small islands near Runde, but at least Storm Petrel probably also breed on Runde. These smallest of seabirds only come close to land in the dark hours, and don't start breeding until July. They are actually quite common along the entire west coast, and on calm night it is usually easy to tape-lure Storm Petrels into some strategically placed mist-nets for ringing. Moving further north along the coast, Cormorants don't breed until we reach the Trøndelag counties. 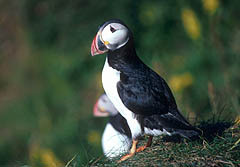 Then there is the Lofoten islands, which hold the bulk of the Norwegian breeding population of Puffins. But for how long? The breeding has failed most years for the last decades, probably due to overfishing on the Herring. The same species as breeding on Runde can also be found in great numbers in Lofoten (and particularly on Røst), except maybe for the Great Skua of which there is just a couple of pairs at Røst. Also along the northern coast of Finnmark numerous colonies excist, too many to mention them all. Another auk is added to the family here: the Brünnich's Guillemot. Along the Varanger Peninsula, finding all the auks, four species of skuas, three species of eiders usually present no problem. Shearwaters don't breed in Norway, but on days with westerly winds Manx Shearwaters from the British colonies can be seen in small numbers along the west coast. In August and September these are outnumbered by Sooty Shearwaters, but again only on days with quite strong westerly winds.